(interior 250 sq m, 1000 sq. meters of outdoor area consisting of terraces and gardens ) . The house is two-storey high. Entrance from the main road along the short private driveway. A garage, at the end of the driveway, provides parking for one car; there is additional parking for two cars along the driveway. • 19 steps up to the main floor of the villa. Entrance is into a roomy and airy living room, elegantly furnished with large sofas placed around an open fireplace. The room is carefully furnished in a Mediterranean style with lamps, paintings and ceramic vase. There is a wooden dining table seating 8. 2 French windows with white curtains open onto a panoramic terrace with spectacular views. This terrace is equipped with a wrought iron table with ceramic top for 6 and wrought iron chairs, another French window open onto a lateral terrace also with sea views. The living-room has also large windows through which you can enjoy a wide-open view of the seascape. • The kitchen can be reached from the living room but also from the terrace, making it easy and pleasant to organize outdoor meals. 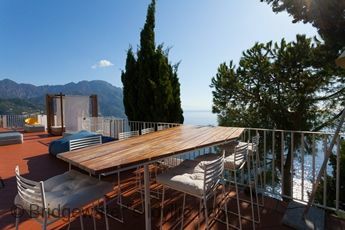 The kitchen is fully equipped with 4 gas rings, dishwasher, microwave, electric oven, fridge, freezer and door leading to the terrace situated in a delightful angle, surrounded by pine trees and a mature violet bougainvillea. You will find this terrace perfect for outdoor meals in front of a breathtaking panorama. It is equipped with a big table for outdoor meals and shaded by awnings. Next to the kitchen is the elevator . In addition, there is also a laundry-room available and a bathroom with modern glass shower cubicle, washbasin, WC, hairdryer, etc.. The upper level, reached either through the indoor staircase ( 20 steps) or the elevator , houses 2 double bedrooms and one bedroom with 2 single beds. The largest double bedroom has en-suite bathroom with large shower cubicle and hydro massage tub, washbasin, WC, etc. ; the other 2 bedrooms share a bathroom, located in the hall, with a modern glass stall shower. Each bedroom has its own TV, a control to regulate the air conditioning and French windows opening onto terraces with sea views. From this floor, the elevator takes to a spacious terrace (reachable also from the entrance of the villa with an external stairway of 45 steps) with terracotta floor, decorated with large terracotta pots overflowing with geraniums. A stairway of 21 steps takes to the upper level with a huge terrace which provides spectacular views of the coast and the sea and comfortable and furnished outdoor spaces. It houses a quite large swimming pool (16x7) , 2 outdoor showers, deck chairs, shaded dining area with table and charcoal barbecue, and an angle furnished as a bar. 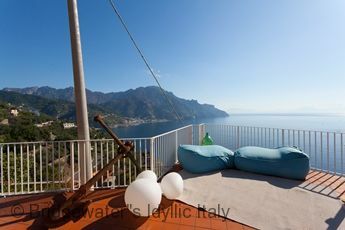 The nearest grit beach is Castiglione di Ravello , 1,5 km away. This is a picturesque half-moon shaped beach , nestled in a little bay surrounded by a high strech of coast. In order to arrive at the beach you have to descend from the road, a public stairway consisting of approx. 180 stone steps. During the summer months you are able to take advantage of a bar and of umbrellas and sun lounges rental facilities. 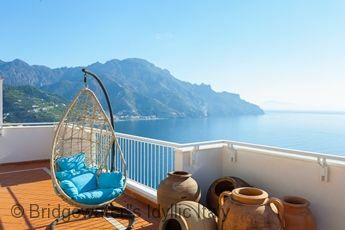 Other beaches that can be reached more comfortably, by car or by bus, are the beach of Atrani (1 km), Amalfi ( 2,5 km) , Minori (5 km) and Maiori (6 km). The nearest supermarket ''DESPAR'' is situated on the main road going towards Ravello at about 2,5 km away. 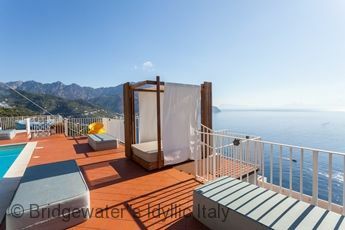 Nearest restaurants, bars, shops, banks, and post office are in Atrani , Amalfi or in Ravello town centre. At approx. 200 meters away, there is the bus stop marked SITA to Amalfi (10 min) and Ravello (10 min), you have to buy the ticket in advance in a tobacco shop. At the port of Amalfi , ferries and hydrofoils ply daily to Capri (1½ h.), Positano (20 min. ), Ischia (2½ h) and Salerno (1 h.). The services operate only during the spinning Summer.